After her surprise wedding last month, actress and model Clara has settled into her new luxury home in Seoul. Clara’s super luxurious newlywed house has been unveiled on a recent episode of SBS’ E-News Exclusive,” which first caught up with the actress as she was preparing to leave for her wedding in the U.S. “I’ll live happily and prettily. Thank you and please support us,” said Clara with a smile. Early last month, the actress and model held a private ceremony in the U.S. where she wed a Korean-American businessman who is two years her senior. After their ceremony, the two settled into their newlywed home in the Jamsil Lotte World Tower Signielin the Songpa district of Seoul. Notably, since the episode aired, the building has begun trending on various search portal sites. In an interview with a building official, “E-News Exclusive” was told that the lowest price for a home was around 4 billion won, around 2.67 million dollars. Likewise, the official commented that the “best price” is 34 billion won ($30.36 million). This is a property that celebrities inhabit with JYJ’s Junsu and actor Jo In-sung being among her neighbors. In the episode, Clara showed off a few rooms in her house including her dining and living areas. 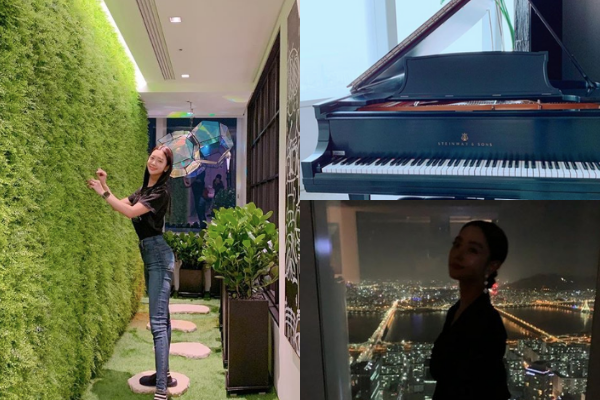 Further, on social media, she also shared additional photos of the view from her home, a Steinway piano, and green garden area. As she reveals more aspects of her new life, many are sending her messages of congratulation, love, and happiness there is a small segment who say that luxury lifestyle is too far from the way that ordinary people live.